Much like people, cities tend to have their own style. Sure, there are common features in all big cities that can make them feel similar—the crowded commutes, towering skyscrapers, innumerable coffee kiosks and taxi-choked downtown thoroughfares. But there is also an undeniable character to each city that immediately sets them apart from one another. This character influences the people of a city and those people, in turn, sustain the very essence of the city. This relationship, we’ve noticed, is often expressed through individual style. Over the past year Indochino has opened brick-and-mortar retail locations from coast to coast, including Philadelphia, New York and San Francisco, and the unique atmosphere of each city is apparent on every street. We engaged influential menswear bloggers and stylists from the City of Brotherly Love, the City that Never Sleeps and the City by the Bay, to explore the relationship between where they live and how they dress. The result: three very different custom suits, and a glimpse at how these iconic cities sway the style choices of the men who live in them. How does your city influence your style? Philadelphia influences my style in so many ways. Philly is a city of go-getters that are always about their business. 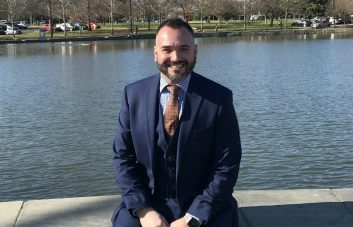 My days are often spent running to meetings with clients, photo shoots and, of course, evening drinks—so that means I like to stay suited! During the warmer months I always switch up my fabrics to linens, cottons and tropical wools to combat the city heat. Philly showed me that it’s best to dress like your biggest moment is right now! What’s the best piece of style advice you’ve been given? Best style advice that I’ve ever received is to find a good tailor and invest in quality footwear! 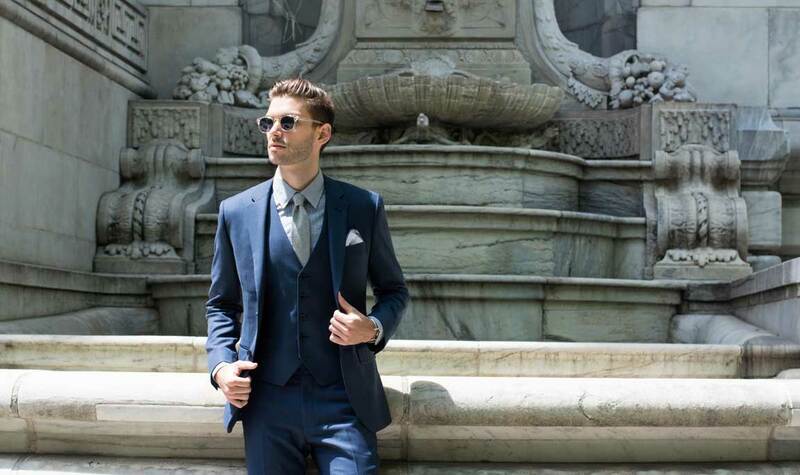 Tell us what you love most about your custom Indochino suit. 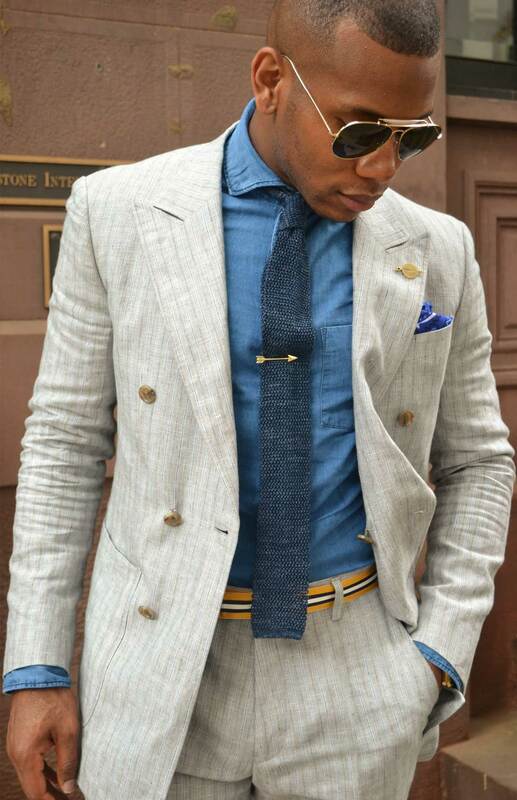 There are tons of details that I love about this custom linen suit. 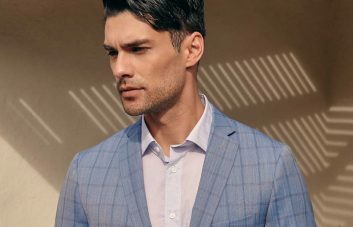 The half-lined jacket keeps me cool and the wide peak lapel gives me a powerful look. However, my favorite feature is the patch pockets on the jacket. Something I believe in is functionality in regard to your clothing and, with the addition of patch pockets, I can actually use them. Read Sabir’s full post about his Indochino Gray Linen Highlighted Stripe Suit on his site Men’s Style Pro. New York is a city on the move! You need clothing that can move with you. I dress in layers, wear comfortable shoes and carry a bag that can hold everything I need for the day. 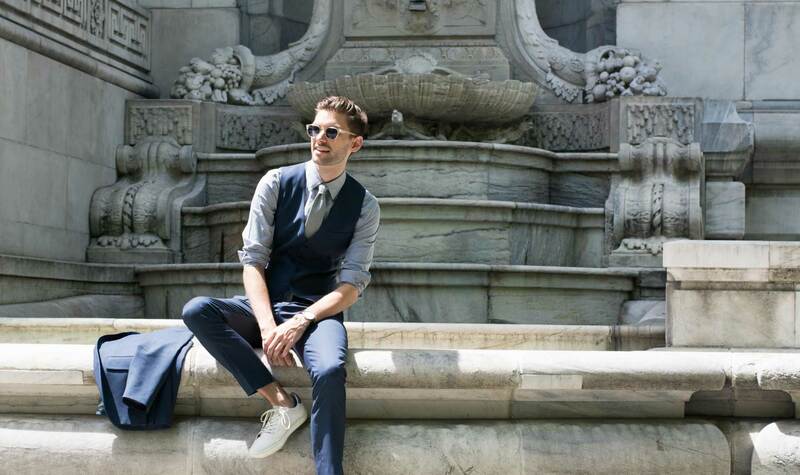 My style leans towards athletic wear, so I pair my suits with t-shirts and sneakers. I don’t work on Wall Street, and convention seems to matter less and less these days. You never know where the day might take you though, so versatility is key. I’m always searching for advice and inspiration. I think it’s key to staying relevant in all aspects of your life. But with all of that information coming in, you have to filter it through your personal lens. The best style advice I have been given is to stay true to what I like. Don’t copy others. Do it my way and own it. I love that Indochino gives you this totally personalized experience from start to finish. You decide every detail of your suit, down to the stitching. Once you perfect everything in the showroom, you can click a few buttons at home and turn out an army of custom-made suits. It’s digital meets made-to-measure. Genius! 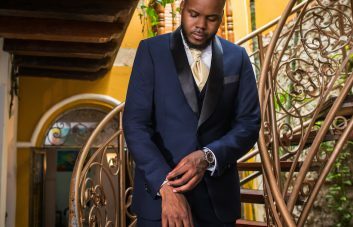 Read Aaron’s full post about his Indochino Essential Blue Sharkskin Suit on his site The Modern Otter. 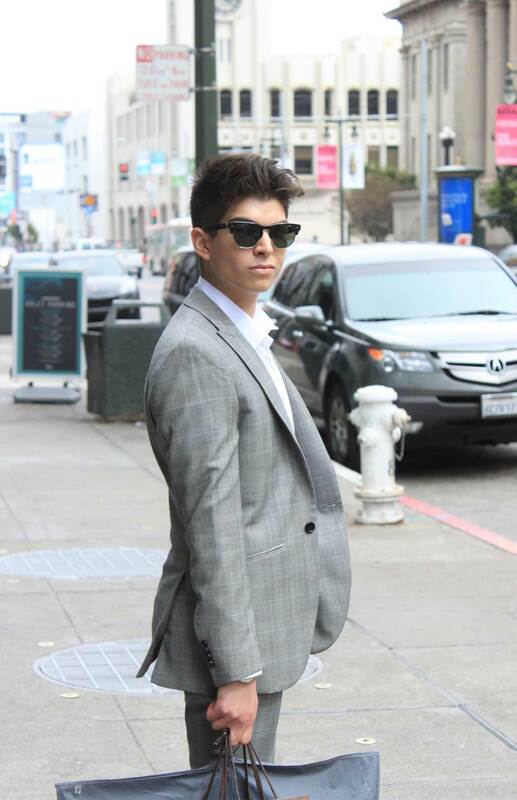 When it comes to my style, I would say San Francisco influences me to be myself. I’m constantly surrounded by people that are always living and breathing confidence, and that’s so inspiring. Two years ago, right around the time I moved into SF, I was going through some stuff. I didn’t know who or what I wanted to be. Living in San Francisco changed that for me; it helped me discover who I am, what I love, I got my first job as a wardrobe stylist, and the rest is history. The best piece of style advice I was ever given wasn’t really given to me. I read it online somewhere. It went something like, “Dress for yourself and no one else.” The quote resonated with me because my style was always pretty different for the area I lived in, so encouragement to be original was probably the best thing I could have come across. Besides, what fun is it getting up every day if you can’t express yourself the way you’d like? 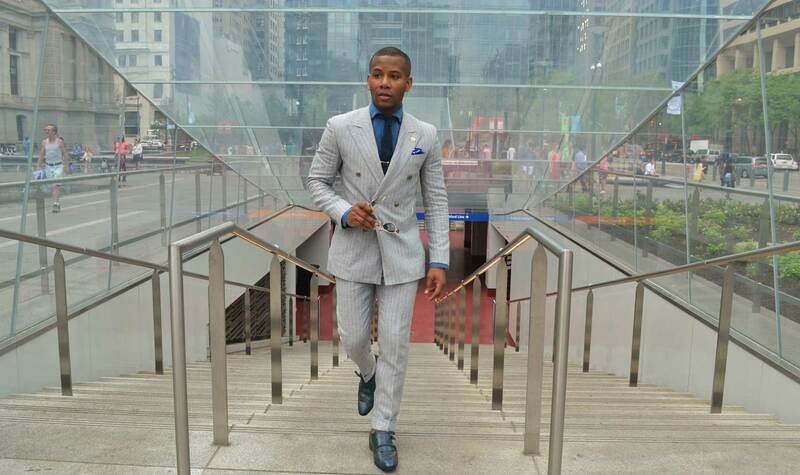 Read Anthony’s full post about his Indochino Essential Gray Prince of Wales Suit on his site Of Mice and Menswear. Ready to rep your city’s style?